All people have essentially the same basic physical and personal needs, and so all societies develop a certain basic set of cultural phenomena to deal with these needs. That we do so is our common humanity, but each culture does so in its own way. Thus, for example, everyone needs food and so societies learn ways to produce food; everyone dies, so societies develop religion to enable them to deal with death; everyone seeks happiness, so societies have music and dance; and everywhere people fall ill, and so all classical societies developed their own systems of medicine and Tibet was no exception. Tibet is a unique place: it is a high, mostly rather arid plateau, isolated from the world by mountains on three sides and by big rivers to the east. Its flora and fauna are quite different from the rest of the world, and are quite rich. Tibet has had a developed civilisation for a very long time. Nearly four thousand years ago there was a unique and isolated civilisation on the Tibetan plateau, and this civilisation developed its own culture based largely on its own inspiration. Tibetans trace many of their cultural phenomena to this early period, called ‘Zhangzhung’, and to the seminal founder of their civilisation-Tonpa Shenrab. 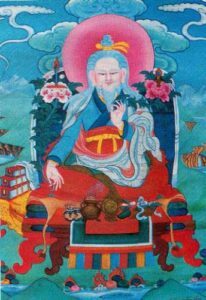 With reference to medicine, Tonpa Shenrab is said to have taught the science of medicine to eight disciples known as ‘the eight sages of medicine’ including one of his eight sons-Kyebu Trishe. All aspects of Tibetan medicine today have been influenced by this early medicine. Particularly, the analysis of the medical properties of the plants and minerals of Tibet derives from this early practice. Many animal products were also used in this time for their medicinal properties, and this lore is still studied. The practice of using animal products declined after the eighth century, however, as trade with India permitted them to replace a good number with plants, and the spread of Buddhism inculcated a reluctance to kill animals. Certain physical therapies still in use derive directly from early Tibetan medicine, or have evolved out of it in the Tibetan culture. In the history of the spread of Buddhism in Tibet, contact with India is described as beginning in earnest in the seventh and most especially the eighth centuries. However, in the teachings on the history of medicine, contact with India is described from the fourth century. At this time a great Indian physician emigrated to Tibet-his name was Biji Gajed, and he was the deciple of the seminal Kashmiri master of medicine, Chandrabhyananda. He brought with him four distinct lineages of medicine from India: one Brahmanical, one Buddhist, one from a line of forest hermits and one from his own family tradition. He also brought the great Indian commentaries on medicine to Tibet. He married a Tibetan woman, and his teaching and medical practice was continued by their son, Dunggi Torchog. While this latter master used Indian theory, he applied the use of local ingredients to his formulas, thus beginning the merger of Indian and Tibetan understanding in medicine. From India, Tibet adopted a whole understanding of physiology and embryology, a theory of treatment and an understanding of life and death according to Buddhist principles. Many texts were translated from Indian languages into Tibetan, and are maintained today as part of the ‘Tangyur’, or collected Indian commentaries. A part of the Tibetan pharmacopoeia is of Indian origin. In the seventh and eighth centuries, Tibet became a politically dominant nation in Asia. During this time, two great conferences were held in Lhasa under royal patronage, to co-ordinate and codify the science of medicine. Physicians came from all the surrounding nations to these conferences, and records were kept of their instructions. The latter was chaired by a great Tibetan physician of his time, Yuthog Yonten Gonpo the elder. He was a family descendent and successor to the teaching of Biji Gajed. In the tenth and eleventh centuries, one of his descendents, Yuthog Yonten Gonpo the younger, brought the science of medicine in Tibet into the form in which we know it today. He developed the ‘Four Tantras of Medicine’, an earlier text, into the form in which we know it today as a fusion of Indian and Tibetan elements, wrote commentaries and taught widely. He was famed as a Buddhist master and a great physician far beyond the borders of Tibet. At the end of his life, vanished into the sky while teaching. Some elements of Tibetan medicine have developed progressively by Tibetan masters over the centuries, starting with indigenous origins and developed progressively over many centuries, possibly integrating some outside elements. These aspects of Tibetan medicine remain uniquely Tibetan. The techniques of diagnosis-sphygmology (diagnosis by means of the pulse) for which Tibetan physicians are widely famed, and urinalysis have developed in this way, as have a number of physical therapies. The way herbs are combined to create particular properties and effects is distinctly Tibetan. Until the seventeenth century, apprenticeship seems to have been the dominant mode of the study of medicine in Tibet. Though a few schools are mentioned in old records, most physicians seem to have learned their profession while in a small group of students attached to a master, whom they served and from whom they learned. This mode of study is still seen in the traditional Tibetan milieu today. But from the seventeenth century on, schools became increasingly important, and today the majority of Tibetan physicians have attended a school of medicine. Graduates are still attached to a master to perfect their art before being considered fully qualified, however. Very important among medical schools in Tibet was the monastery of Chagpori (1696-1959) in Lhasa. Here students from all over Tibet were brought to the highest levels of understanding. Due chiefly to its influence, Tibetan medicine was the standard medical system not only in Tibet but also throughout the Himalayas, in Mongolia and in much of Asian Russia. In 1912, H.H.Dalai Lama XIII founded the Mentseekhang, or Institute of Medicine and Astrology, in Lhasa, to assure services to all parts of the country. Its medicine lineage and first teachers came from Chagpori. This was an important institute until its closure in 1959. Currently, the institutes in Dharamsala and in Lhasa which bear its name perpetuate its lineage. Though the Tibetan system of medicine was persecuted under various communist regimes, some masters survived to perpetuate its great understanding. Today there are schools in the Himalayas, in Tibet and in Mongolia, remedies are being made in increasing amounts and variety, and more clinics are being opened.